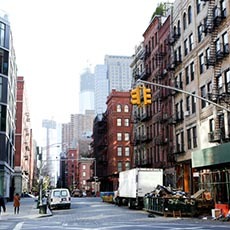 TriBeCa is short for “Triangle Below Canal.” TriBeCa stretches from Canal Street and Broadway to south west of Vesey Street and Hudson River. TriBeCa is famous for its former industrial buildings, many of which are now converted to residential buildings. 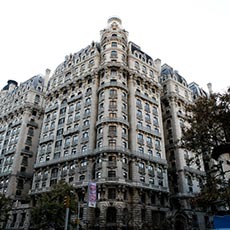 It is a mix of modern high-rise building and old-style lofts and tenement. Washington Market Park ( at Greenwich Street). TriBeCa is home to TriBeCa Film Festival. 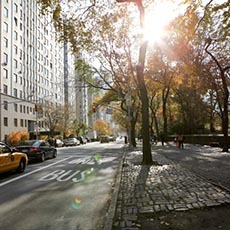 TriBeCa is a quiet yet cosmopolitan neighborhood. 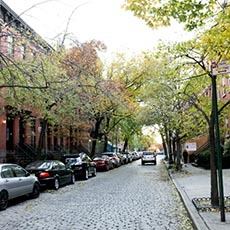 With the streets mixed with asphalt and cobblestone, the area has a low-key and peaceful atmosphere at the daytime; by night, it turns more exciting along Greenwich Street. Famous restaurants such as Nobu, Bouley, Wolfgang’s Steakhouse, Scalini Fedeli, and etc. People can shop from food, furniture, to art supplies.